Mio Cyclo 105 cycling GPS is the perfect training partner for cyclists. With a mono screen of 1.8-inch it can be used in portrait or landscape orientation. The information available to you includes time, speed, distance, height, calorie consumption and saved tracks too. 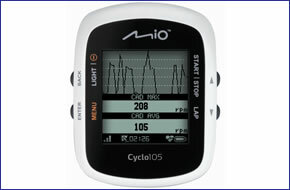 Mio Cyclo 105 navigators include an Ant+ sensor and some models also include cadence sensor and/or wireless heart rate monitor. You can share your experiences with other Cyclo 105 users using the Mio share desktop application and you can also compare your performance/progress against previous cycles rides. This cycling device is waterproof and designed for use in all weather conditions with an 18 hour battery life. Mio Cyclo 105 has been discontinued. Accessories, spares and parts are still available for your Cyclo 105. The Cyclo 105 entry-level bike computer is the perfect partner to keep track of your performance whilst cycling. It features an anti-glare mono 1.8-inch screen and can be used in either portrait or landscape orientation making it a very versatile system for your bike. ‣The 105, 105H and 105HC come with Ant+ sensor but only the H and HC models include wireless heart rate monitor and/or cadence and wheel sensor. The Cyclo 105 collates all the important information whilst you are cycling, including measuring your time, speed, distance, height, calorie consumption and saves your tracks too. The menu is very easy to read and the dashboard can be customised to display the information you need at a glance. You can share your experiences using the Mio share desktop application. You can challenge yourself and improve your performance by comparing your progress on the Cyclo 105. You can also manage route history and download other users routes so that the roads and areas others find interesting are available for you to use and compare your statistics/performance with other cyclists. Mio Cyclo 105 is a very compact device and it is rugged and waterproof to IPX7 standards making it ideal for use in all weather conditions. Furthermore it has a battery life of 18 hours so you will not need to worry about running out of power whilst using the Cyclo 105 whilst cycling on long journeys or multiple short journeys. If you are looking for a bike computer with street-level road maps then we recommend buying the Mio Cyclo 300, Cyclo 305 or the 505 Cyclo model. ‣Cyclo 105 (Product Code: MC105) - the base Cyclo 105 model includes ANT+. ‣Cyclo 105 H (Product Code: MC105H) - Cyclo 105 H model with ANT+ and Heart rate monitor. ‣Cyclo 105 HC (Product Code: MC105HC) - Cyclo 105 HC model with ANT+, Heart rate monitor, Cadence monitor + wheel sensor. ‣Both the 105 and 105 HC include Ant+ sensor. The HC model includes wireless heart rate monitor and cadence and wheel sensor. When you buy the Cyclo 105 from ActiveGPS you have everything in the box to get you up and riding (as listed above). There are however additional accessories which are also available to purchase from ActiveGPS.